Jimmy Jemain, is The official UK No.1 Cliff Richard Tribute and Europe's finest and most Professional Tribute To Cliff Richard. Jimmy Jemain (sometimes wrongly spelt Jimmy Jermaine) has met Sir Cliff Richard and the Shadows on many occassions and Cliff and the Shadows are very proud of Jimmy Jemain's tribute Show. 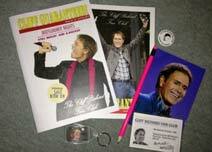 Jimmy Jemain as Cliff Richard is available with Hank and Bruce Soundalikes or with a full Shadows Tribute Band. The Official Cliff Richard Website Pretty self explanatory title me thinks! Chris Eaton Find out more about this wonderful song writer! Cliff Tube On this page you will find a collection of youtube-Videos of or about Cliff Richard. Retrosellers Retrosellers is a website which provides a 'one-stop' portal/directory of all the best nostalgia and retro businesses around the world. But they aim to be much more than a directory. They will provide articles, news and information on all aspects of retro and nostalgia, from hints on collecting rare vinyl to a day in the life of a tribute band, from avoiding fake autographs to finding the best nostalgia holiday locations.